Elizabeth and Robert Dudley were life-long friends - and possibly lovers. Elizabeth attended the marriage ceremony between Robert Dudley and Amy Robsart. 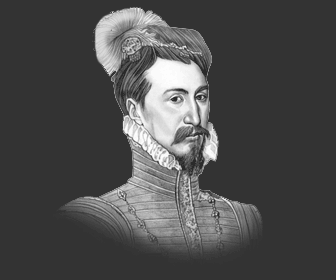 Robert Dudley was the son of John Dudley who attempted to make Lady Jane Grey Queen of England instead of Mary Tudor. The plot failed and his father and brother Guildford Dudley were executed along with the tragic Lady Jane Grey. Robert Dudley was imprisoned in the Tower of London for his part in the conspiracy where he narrowly escaped death. Whilst imprisoned in the Tower of London he was joined by another prisoner - Elizabeth. Both Elizabeth and Robert Dudley were released and Robert Dudley sold some of his lands to help Elizabeth who needed financial help. Elizabeth never forgot the help that Robert Dudley had given her and rewarded his loyalty when she became Queen. Their relationship became closer and closer but the death of his wife, Amy Robsart, in suspicious circumstances prevented any plans for their marriage. Robert Dudley continued to hope that Elizabeth would marry him but after years of waiting he realised that this would never happen. In 1578 Robert Dudley married Lady Lettice Knollys, widow of the Earl of Essex and cousin to Queen Elizabeth ( Lettice Knollys was the grandaughter of Mary Boleyn ). Elizabeth was furious with Robert Dudley but she eventually forgave him. Robert Dudley stayed close to Elizabeth until his death in 1588. Some interesting facts, timeline and biography information about the History, Life & Times of Robert Dudley. Additional details, facts, history, timelines and information about the famous Elizabethans and events in Elizabethan Times can be accessed via the Elizabethan Era Sitemap.